This series of progress work shows how I create photographic collages. I start in my studio with a model to photograph and an idea in my head. I studied film photography in college with a manual camera and a darkroom. But, around 2004, I got my first digital camera and loved it! Next I taught myself Photoshop (with help from my son) and realized the potential for creating art. I 'cut out' the model from the background in Photoshop. From here I can start adding all the artistic elements. In this case I will create a leaf and grass fairy dress starting with some ginkgo leaves. I can take my ginkgo leaf photos and 'bend' them in Photoshop to fit around the model. Painting in some shadows helps make it feel real. But, as you can see she was not actually wearing any leaves or grass! Adding more elements, I feel pretty satisfied with how she looks, so far. But, I am a long way from completion. All the grass and leaves in her costume were photographed from my own yard and carefully cut out in Photoshop. The body art was digitally painted. Next begins the background work. The name of this artwork is Summer Whispers. 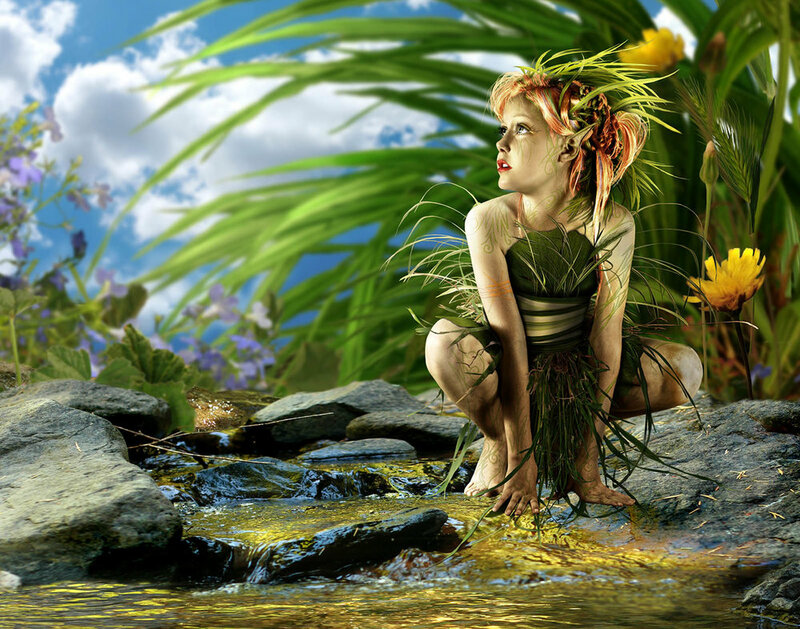 I wanted it to feel like this little garden fairy had found an oasis in the long, hot summers we experience here in northern California where I live. Again, every element of this artwork was from my own yard. Each flower, rock, grass, and dandelion was photographed separately, then cut out in Photoshop to add to this image. That's why I call them Photographic Collages. I like the way this looks but the colors are too vibrant at this point. So, next I will be correcting this aspect. When I create an image like this, there are many, many steps and not all of them are included in this posting. If you are familiar with Photoshop, I generally have hundreds of layers for every artwork. I like to work this way because I think it feels more natural and original rather than using techniques where the computer does some of the work. The Fairy wings are added which are also digitally painted. A few more touches and the artwork is finished. **Important note: Whenever I create any kind of photographic artwork, I use all my ownoriginal photography...models, backgrounds, and anything else in the picture. Artists that use stock photos are creating a collaboration with other artists.